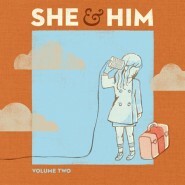 Heav­i­ly hyped indie duo She & Him, com­posed of actress Zooey Deschanel and musi­cian M. Ward, released its sec­ond album, Vol­ume Two, which (unsur­pris­ing­ly) fol­lows its 2008 debut Vol­ume One. Hype aside, how­ev­er, Vol­ume Two is, at its best, lit­tle more than a strik­ing­ly banal indi­ca­tor that the pur­pose of She and Him is aimed more towards reviv­ing the most cloy­ing­ly cheer­ful soft rock from the his­to­ry of the genre than writ­ing gen­uine­ly cre­ative music, and at its worst, awful. From a pure­ly tech­ni­cal stand­point, while there is some musi­cal rep­e­ti­tion (thought not near­ly as much as lyri­cal), Vol­ume Two does not have many prob­lems. Everything’s most­ly in tune, noth­ing is too jar­ring, and indi­vid­ual lines are cer­tain­ly not bor­ing. Unfor­tu­nate­ly, that’s about the best that can be said about Vol­ume Two. Some tracks are over­ly sim­i­lar musi­cal­ly, everything’s over­ly sim­i­lar the­mat­i­cal­ly, and when it’s not just plain irri­tat­ing, it’s just plain bor­ing. There are the few very lim­it­ed, tru­ly inter­est­ing sec­tions, includ­ing about half of “Home” (the track con­tin­u­al­ly mod­u­lates into inter­est­ing minor mini-sec­tions, only to spring back out into the cheer­i­ness that is the entire rest of the album), but that’s quite hon­est­ly about all the album has to offer. As with Vol­ume One, Deschanel pro­vides vocals for Vol­ume Two. The best that can be said of this is that her voice fits quite well with the inces­sant­ly effer­ves­cent tone of the music. The rest, unfor­tu­nate­ly, doesn’t come out quite so well. It’s not that Deschanel can’t sing. Instead, it’s that she can­not seem to stop being so damn cheer­ful. Every line of Vol­ume Two seems to be infused with an infu­ri­at­ing­ly vacant glee that does less to lend emo­tion to the album than it does to make every moment indis­tin­guish­able from the rest. Cheer­ful music isn’t nec­es­sar­i­ly a bad thing - but when an album has been so obvi­ous­ly packed with painful­ly inane whim­sy, as Vol­ume Two has, it is. Vol­ume Two is com­posed of eleven orig­i­nal songs and two cov­ers, each of which some­how man­ages to be just as repet­i­tive and obnox­ious­ly insipid as the last. Essen­tial­ly - when the deep­est, most thought-pro­vok­ing line an album con­tains is “I could be sweet / And I could be sweet­er,” either some­thing has gone bad­ly wrong in the writ­ing process or the album was nev­er meant to stand up to scruti­ny any deep­er than a read­ing of the track titles. In that spir­it, Vol­ume Two is com­posed of emo­tion­al­ly stilt­ed love songs, the occa­sion­al mediocre metaphor, and as much rep­e­ti­tion as an album can hold. The real prob­lem with the cheery vapid­ness that con­sumes Vol­ume Two is just that - it con­sumes the album. While many albums get away with tracks that pur­pose­ful­ly sound intel­lec­tu­al­ly emp­ty, in order to achieve a spe­cif­ic effect, if the whole album is sim­ply emp­ty of any­thing oth­er than pure light­head­ed­ness, you’re left with the feel­ing that no amount of thought actu­al­ly went into mak­ing the album. There are hap­pi­er albums than Vol­ume Two, there are more cre­ative albums than Vol­ume Two, there are more stim­u­lat­ing albums, and real­ly, there are just bet­ter albums than Vol­ume Two.